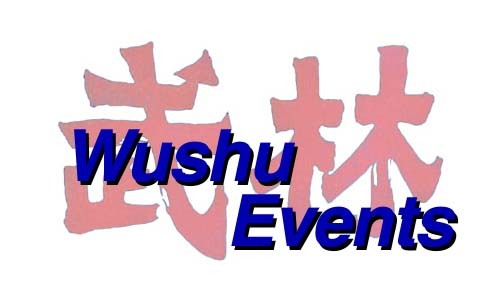 I have created this page as a place to list upcoming tournaments, seminars, performances and other wushu events. Please email me if you have an event you'd like listed. Please include contact info, websites, etc. DISCLAIMER - No endorsements are made of events listed here. July 1st-3rd - Orlando, FL, USA - '7th Annual International Chinese Martial Arts Championship' - hosted by Nick Scrima. Click here for more info. Apparently had nearly 900 competitors last year. August 5-7th, 2005, Las Vegas, NV - US Wushu Union's 2005 Nationals, held on the campus of UNLV in Las Vegas (having a wushu tournament in Vegas, what a great idea! :-) Click here for more info. USWU's national ranking and team selection, and cash ($$$) for grand champions. USWU events are famous for their professionalism and fairness. I recommend checking it out! August 6-7th, 2005, S. Windsor, CT - USAWKF's 2005 Nationals and US Team trials. Its rather sad that the USAWKF waited til May 5th to announce their team trials and nationals and chose to do them on the exact same weekend as another tournament. This event will serve as the team trials for the 2005 US Wushu Team that will compete at the World Wushu Games. But as I have mentioned innumerous times on the wushu news page, the USAWKF is infamous for running expensive, highly non-transparent and generally less than fair events. (as shown by the 2001 and 2003 team trials). Buyer Beware! February 26th - Davis, California, USA - 9th Annual Collegiate Wushu Championship - hosted by UC Davis' wushu club. Featuring collegiate team competition, also featuring a 'big tricks' competition and banquet, open to college students and recent graduates, please be sure to check the eligibility rules. Click here for more information. April 2nd, 2005, Berkeley, California - 13th Annual UC Berkeley Chinese Martial Arts Tournament. One of the largest, best run events in the US, hosted by the UC Berkeley Wushu Club, be sure to check it out. Go to for more information. February 21st, 2004 - Palo Alto, CA - 8th Annual Collegiate Wushu Championship. This year's event is hosted by the Stanford Wushu Club and will be held on the Stanford Campus. Event is open only to college students. click here for more info. April 10th, 2004 - Berkeley, CA - 12th Annual UC Berkeley Chinese Martial Arts Tournament. Hosted by the Cal Wushu Club, this event has turned into one of the premiere Chinese Martial Arts events in the USA, especially for contemporary competitors. Its affordable, organized, professional and entirely run by student volunteers. Go to Cal Wushu's tournament page for more info. April 9-11, 2004 - Falls Church, VA - International Martial Arts Championship. Hosted by Sifu Clarence Burris, presented by the Chinese Martial Arts Institute of Fairfax, VA. Promises to be a good fair tournament with contemporary, traditional, internal and non-chinese forms divisions as well as sparring. Click here for more information. May 1-6, 2004 - Shanghai, China - 7th Shanghai World Grand Wushu Festival - sanctioned by the Chinese Wushu Association and organized by the Shanghai Sports Federation. Click here for more information. July 2-4, 2004 - Orlando, FL - 6th International Chinese Martial Arts Championship. Hosted by Sifu Nick Scrima Click here for more information. July 10-11, 2004 - Kuching, Sarawak, Malaysia - The 5th Malaysia Sarawak International Nanyang Wushu & Golden Lion Dance Festival, oganized by the Nanyang Wushu Federation of Sarawak and sanctioned by the Martial Arts Federation of Malaysia. Click here for more information. July 10-11, 2004, Annandale, VA - 5th Pan American Wushu Championships - organized by the USAWKF, this event is being held in conjunction with the USAWKF's International Festival and USAWKF's Nationals. Click here for more information. August 9-10, 2004 - Beijing, China - 5th International Wushu Invitational Tournament. Organized by the Beijing Wushu Institute and Beijing Sports Bureau, hosted by Wu Bin, former Beijing Wushu Team Head Coach. Click here for more information. August 13-15, 2004 - Pittsburgh, PA - US Wushu Union's National Chinese Martial Arts Championships. This event serves as the national ranking event for the US Wushu Union. To be eligible for ranking you need to qualify at a USWU qualifier event, see the website for more details. Click here for more information. October 20-25, Zhengzhou, China - First World Traditional Wushu Festival. Organized by the International Wushu Federation. Click here for more information. April 19th, 2003 - Berkeley, CA - 11th Annual UC Berkeley Chinese Martial Arts Tournament. Hosted by the Cal Wushu Club, this event has turned into one of the premiere Chinese Martial Arts events in the USA, especially for contemporary competitors. Its affordable, organized, professional and entirely run by student volunteers. Go to Calwushu.com for more info. Summer 2003 - USA - Wushu Summer Camps organized by the Young American Program in conjunction with Wu Bin. Coaches will include former Beijing Wushu Team Champions. Locations are as follows: -UPDATED! Contact, coaches and content info are on the news page's 4/6/03 entry - click here for more details. Location information can be found on the new's page 6/6/03 entry - click here for more details. July 26-27, 2003 - Annandale, VA - USAWKF International Wushu Festival and Championships - hosted by Omei Wushu Center. Click here for more details. August 8-10, 2003 - Pittsburgh, PA - US National Chinese Martial Arts Championships - hosted by the US Wushu Union. To compete for National Ranking you must qualify at a qualifying event or at the on-site qualifier. This event has a $500 CASH PRIZE for Grand Champions (1 male and 1 female) -- woo hoo! Click here for more details. August 28 - September 1st, 2003 - Beijing, China - Phoenix and the Dragon Training Retreat - 3 day training program. Click here for more details. November 2-8, 2003 - Macau - 7th World Wushu Championships - Held at the Macau Forum. This year competition will not include old(replaced) compulsory forms, but will include a sparring set division. December 13-14, 2003 - Palo Alto, Fremont, CA - Seminars by Beijing Wushu Team Coach Cui Yahui: Rope Dart and Preying Mantis. Check it out - Click here for more information. February 16th, 2002 - Eugene Oregon - The 6th Annual Intercollegiate Championship, hosted this year by the University of Oregon. Open to all wushu (internal, external, traditional or contemporary) who are enrolled in college. Click here for more information. April 2002 - Berkeley, CA - 10th Annual UC Berkeley Chinese Martial Arts Championship, hosted by the UC Martial Arts Program and the Cal Wushu Club, more info coming. February 17th - Fullerton, CA - 2001 Collegiates - to be hosted by California State University at Fullerton. Click here for rules, reg forms and more info. April 21st - Berkeley, CA - 9th Annual UC Berkeley Chinese Martial Arts Championship - Hosted by the Cal Wushu Club. West Coast's biggest annual chinese martial arts tournament. Click here for the official website. April 21st - Berkeley, CA - USAWKF Board of Directors US National Team Trials- Hosted by the Cal Wushu Club. This event will serve as the Taolu (forms) team selection event for the WKF Board of Directors. It will be run concurrently with the UC Berkeley Chinese Martial Arts Championship. Click here to go to the USAWKF.COM website for the latest info on registration, etc [NOTE - the Anthony Goh WKF is also planning on holding a team trials event for April 28th, please see www.usawkf.org for information on that event]. June 29th-July 1st - Toronto, Canada - 2001 Canadian National Team Selection - held by the Confederation of Canadian Wushu Organizations. Competition will use the new compulsory sets and the tournament (but no team spots) is also open to international competitors. Click here to view their website. August 31-September 3 - Pheonix, AZ - Master Li Jinheng's 2001 Grand Championship Festival - A great competition, I've been the last two years in a row - click here for more info. October 4 - 7, 2001 - Yerevan, Armenia - 6th World Wushu Championships - If you've ever looked for an excuse to visit the Caucasian country of Armenia, this is it! December 2001 - March 2002 - Los Angeles, CA - Monthly Changquan Seminars taught by former Beijing Wushu Team member Li Jing. click here to go to the webpage for more details. July 28th-30th - Hunt Valley, MD - 2000 International Kuoshu Championship Tournament. The US Chinese Kuoshu Federation's big annual event. Info is at http://www.usckf.org/usckf/events/index.shtml. August 2nd-7th - Baltimore, MD - 2000 International Wushu-Kungfu Festival and Championships. Despite the USAWKF change of power, it appears this competition will take place as planned. More info is at http://www.usawkf.org/events-fest.htm. August 8th-9th - Beijing, China - 3rd International Wushu Invitational Tournament. Hosted by the Beijing Wushu Team's Wu Bin. click here to for more information and registration materials. August 12th, 2000 - Cupertino, CA - Chinese-American Athletic Tournament. Website is at http://www.caatc.org/wushu.html. August 31st - September 3rd - Scottsdale, AZ - Li Jinheng's 2000 Grand Championships & Festival. More information can be found at http://frontpage.inficad.com/~worldmartialarts/. Email worldmartialarts@inficad.com or thewushuway@hotmail.com for more information. October 6-8th - San Diego, CA - The WKF Board of Director's National competition. This event is being held in place of Anthony Goh's Baltimore Tournament as the WKF Nationals Tournament. For more info, check out http://www.usawkf.com, or email WKFInfo@aol.com.